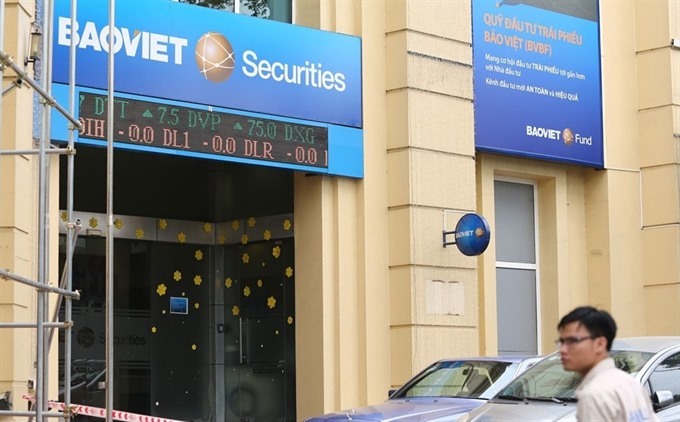 HÀ NỘI — Bảo Việt Securities Joint Stock Company (BVSC) targets VNĐ504 billion (US$22.4 million) in total revenue and VNĐ134 billion in post-tax profit for 2018, the company has announced. The expected figures are up by 4.2 per cent and 9.5 per cent, respectively, compared to last year’s performance, the company’s management board said at the annual shareholders’ meeting on Tuesday. In 2017, BVSC earned VNĐ483.8 billion in total revenue and VNĐ122.4 billion in post-tax profit, up by 47.8 per cent and 27.1 per cent from 2016. The company exceeded its full-year earnings forecast for 2017 by 49.3 per cent in revenue and 10.7 per cent in post-tax profit. The expected earnings for 2018 are also higher than the previous numbers reported in the local media. The growth in BVSC’s earnings in 2017 came from good market trading conditions with the local stock indices – the VN Index and HNX Index – achieving good gains throughout the year as well as from higher-than-expected performances in three key segments – financial services, investment and advisory. BVSC also plans to utilise 5 per cent of its post-tax profit to fund its charter capital reserve and another 5 per cent to add to the financial risk provision. The company will also add VNĐ5.1 billion to its welfare fund and pay VNĐ50.5 billion worth of 7 per cent dividend to existing shareholders. The remaining amount of post-tax profit worth VNĐ45 billion will be used to fund the company’s business activities in 2018. Thirty-two shareholders, including 10 authorised ones, attended BVSC’s annual shareholders’ meeting. They hold 43.65 million shares, or 60.46 per cent of the total number of voting shares.